Aiming to bring the party to the pool, Aqua Zumba is the latest variation of the Zumba fitness craze that has swept the world. This modern day interpretation of aqua aerobics has all the energy and dynamism that you would expect from a Zumba class, but with the added resistance of doing it in the water. It seems like the world has gone Zumba crazy. To date over 12 million people in more than 125 countries have discovered Zumba. If you are one of the few who hasn’t come across this fitness craze yet it’s a high tempo Latin infused class that combines dance, music and fitness. With the strapline ‘ditch the workout and join the party’ classes are intended to make you feel more like you are in a nightclub than a gym. Following worldwide classes, DVD’s and even a computer game it has now reached the swimming pool. I was a little unsure what to expect. I imagined it would be a bit like aqua aerobics that was popular in the 90’s but as I had never taken one of these classes that didn’t help me very much. Usually my time in the pool is spent doing lengths so I instinctively took my goggles along, but they weren’t needed for the 45 minute class. The instructor positioned himself on the side of the pool and myself and the other women (there were no men taking part) lined up in a couple of rows in front of him. We were about half way down the pool so the water was around chest height. The music began, with the high energy beats that are typical of Zumba classes attracting attention from the curious onlookers in the neighbouring gym. We started to warm up following the incredibly bubbly instructor’s lead. At first it was quite strange trying to move in the water and I felt quite clumsy as the water worked against my limbs. But I soon got used to the feeling and the harder you worked the more resistance you felt against the water. 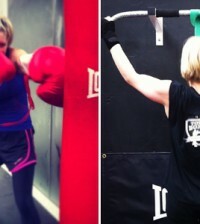 We were led through a series of different routines and I found myself preferring it to the dry land version of Zumba. I’m not a natural dancer and I always find Zumba a little cringeworthy as I try to shake and move to the rhythm. But in this class the routines were simpler and the moves slower because we were in the water which meant I could keep up better. And as most of your body is under the water it’s less embarrassing if you are not a natural mover! The natural resistance of water adds a new element to this kind of class. You can really feel your muscles working as you lunge, stretch and twist in the pool. You are also giving your core a great workout as you try to stay upright and balanced whilst doing the moves. It is very low impact, compared to a similar routine on dry land, so is more suitable for people with joint and bone problems. All ages, shapes and sizes – because it is low impact it will be suitable for most people. You don’t even need to be able to swim as the water is only at chest height. If you find normal Zumba classes too intense then this is a great beginner’s option and a good way to build up your basic fitness levels and your confidence. While it will help you develop strength and toning in your muscles, I didn’t find it gave me a cardio workout, so if that’s what you are looking for I’d recommend the original style Zumba. 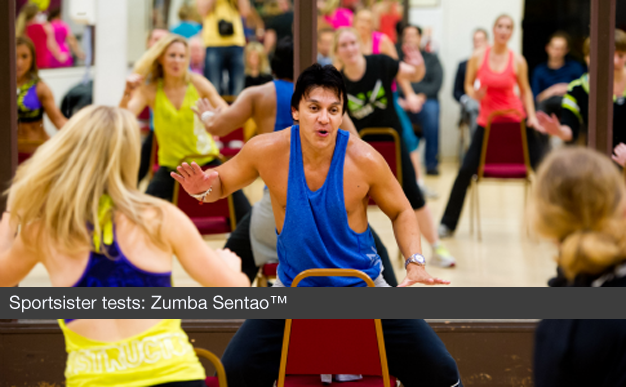 Classes are available at Virgin Active Health Clubs or you can head to www.zumba.com and click on ‘find a class’. Video: What do you get if you cross Zumba and Vanilla Ice?